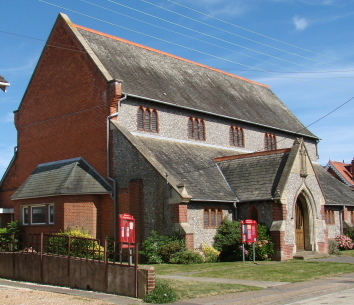 A mission church was established in 1899 for the newly developed northern part of the town under the auspices of St Mary’s, the parish church (VCH 5(2) p200). It used a temporary building that soon became too small (BN 99 p311) and the first part of a permanent one was built between 1908 and 1910. This consists of a five-bay nave, built of pebbly flints with minimal lancets in brick, grouped in threes, and a substantial south porch. Signed elevations by F Wheeler and C R B Godman (whose responsibility is confirmed in CDG 177 p142) are displayed in the church and show that it was intended to add a chancel, for which the land remained vacant, but this was never built. 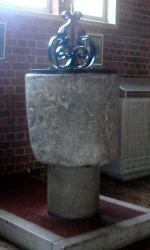 At the join between chancel and nave to the south there was to have been a simple tower with a pyramid spire and the church would have been completed by a further bay at the west end which was not intended to have an arcade and would have contained the baptistery. Although the east wall was meant to be temporary, it looks surprisingly permanent with three stepped lancets. 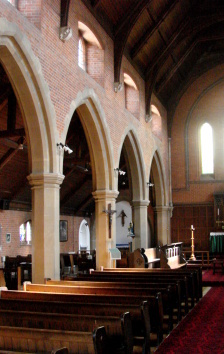 These would not have been re-used if the chancel had been built, for the elevation of this part of the church shows a three-light window with Decorated tracery, set high, was intended. The seeming permanence of a supposedly temporary arrangement might suggest that the addition of the chancel was always an objective for the longer term. The interior is mostly faced in brick with a roof with arch-braces and arcades. The latter are of stone and rather old fashioned for the date. The church remained in its truncated state even after a full parish was established in 1929 (VCH ibid) and until plans were made in 1949 by the same architects (responsible architect E W Owen) for a hall at the west end, to be accessed from the church (ICBS). The hall was built, but has in fact no direct access from the church, which was finished off with a brick west wall, blank except for a low protruding baptistery. The church has been made redundant and the parish re-united with that of St Mary with effect from January 2018. No announcement about the future of the building has yet been made. Font: Plain tub on a narrower modern stem. 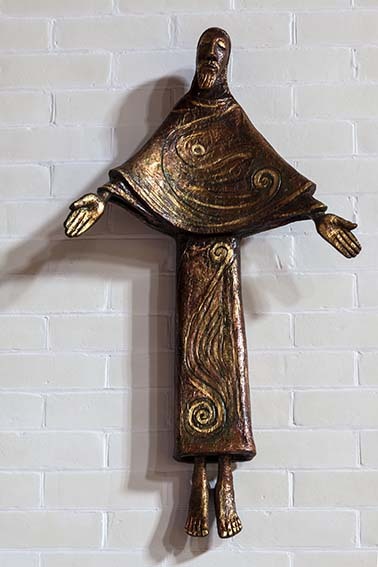 It is described as ‘Norman’ and said to come from St Mary (Mosse (ed) p12). Such a dating is generally supported by the most recent survey (www.crsbi.ac.uk retrieved 8/4/2013), though the term spans a period of around 150 years. Statue: (East wall of north aisle) Christ by P E Ball. My thanks to Nick Wiseman not only for the photograph of the statue by P E Ball but for identifying the artist.